(San Antonio, Apr. 10, 2019) — The University of Texas at San Antonio (UTSA) has been tapped by The National Aeronautics and Space Administration (NASA) to join a team that will build homes for human habitation on the moon and Mars. As exploration missions beyond Earth become more ambitious, NASA must consider new technologies to keep habitats operational when they are not occupied by astronauts. 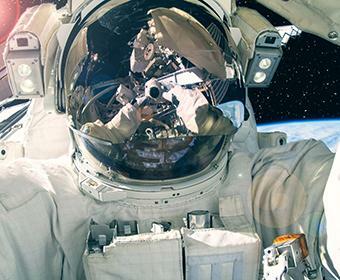 To help achieve this, NASA has selected UTSA to be part of its Space Technology Research Institutes (STRIs) to advance space smart habitat designs, or SmartHab. This research will complement other NASA projects to help mature the mission architecture needed to meet challenging exploration goals. UTSA, led by Arturo Montoya, an associate professor with dual appointments in the Department of Civil Engineering and Mechanical Engineering, will join NASA’s Resilient ExtraTerrestrial Habitats institute (RETHi). The RETHi seeks to design and operate resilient deep space habitats that can adapt, absorb and rapidly recover from expected and unexpected disruptions. It plans to leverage expertise in civil infrastructure with advanced technology fields such as modular and autonomous robotics and hybrid simulation. As part of the RETHi program, UTSA will receive financial support to build computational models including the algorithms needed to build resilient moon and Mars future homes. “This grant will allow UTSA, and its students, to play a key role in solving the challenge of deep space habitation, while building partnerships with NASA facilities, universities and industries,” said Montoya. Through an integrated effort, RETHi will mature deep space habitats that can operate in both crewed and un-crewed configurations. The institute plans to create a cyber-physical prototype testbed of physical and virtual models to develop, deploy and validate different capabilities. The RETHI team includes Purdue University, the University of Connecticut, and Harvard. In addition to RETHI, NASA will also fund a second institute: Habitats Optimized for Missions of Exploration (HOME). HOME’s design approach for deep space habitats relies on proven engineering and risk analysis and on emergent technologies to enable resilient, autonomous and self-maintained habitats for human explorers. UTSA with other collaborators will be funded by NASA’s Space Technology Mission Directorate, which is responsible for developing the cross-cutting, pioneering, new technologies and capabilities needed by the agency to achieve its current and future missions. As one of the top research universities in the country, UTSA along with the new institutes could receive as much as $15 million over a five-year period.